Warehouse Racking – What is it? If you need racking for your warehouse, there are several types of warehouse racking you can consider. The most commonly seen ones are the blue orange racks in large warehouses. These are known as pallet racks but it can be used to a store anything other than goods on pallets. Pallet racks can take anything up to over 2oookg and can reach well over 6M if your warehouse has a high ceiling or roof. The most common warehouse racking anyone would remember should be the blue orange racks found in most warehouses. These are known as the pallet racking system, these types of warehouse racking system are highly customisable to the length, depth and height of your warehouse. The other type of warehouse racking looks highly similar and are available in all blue. These are known as the longspan racking system. 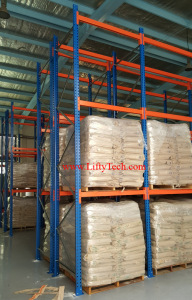 These type of warehouse racking performs similar function like the pallet racking system but are usually used in smaller places and have less load capacity per level. They are also commonly used as long packing stations or workbenches. Which type of warehouse racking is suitable? Generally speaking, if you do not require high capacity and need only a few racks, you would be looking at the longspan racking system. If you have a large space and most of your goods are palletised (on pallets) then the pallet racking system would high likelihood be the warehouse rack of choice. This is of course a largely just a generalisation. There are times where a small place would need a pallet racking system and vice-versa. You won’t need to tell us which warehouse racking you need, we will come down to your place to tell you what is best for you. What information do I need when looking for a warehouse rack? Feel free to drop us a message and we will drop by your place to give you some suggestions.